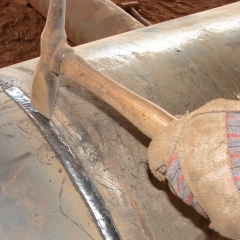 Steel Piling and Steel Casing Pipes require professional quality welded pipe. Southland Pipe is a major structural grade steel pipe supplier that fabricates custom length pipe and assemblies for customers in the building and utility construction industries. 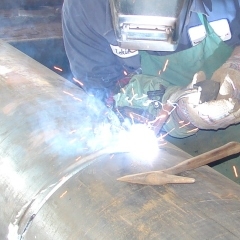 Most of our fabricated steel pipe orders require adjoining welds, such as midwelds. We have welders who are AWS D1.1 certified to meet your stringent requirements for performance piping. 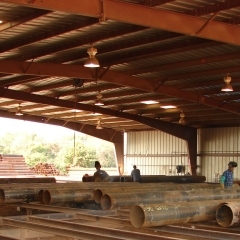 Since 1992, Southland Pipe & Supply has provided carbon steel pipe fabrication for customers and distributors across the Southeast, and across the country. As a nationwide supplier of made to length prime pipe, structural grade pipe, and fabricated steel pipe assemblies, we mechanically bevel and torch cut, weld, fabricate, coat, and truck our custom manufactured products throughout the United States. We have 25 welding and pipe fabricating employees who, on average, have 5-10 years experience with us. ASTM A252 Pipe Fabrication Additional Options: steel plate, angle, shoes, conical points. Optional coating services available. Call us or Email us at sales@southlandpipe.net when you have a need for cut to length, custom fabricated steel pipe.